Posted: Thu Nov 01, 07 11:00 pm Post subject: Bee successful! 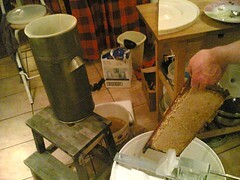 We took forty pounds of honey off our beehives the day before yesterday! It was only two super's worth and very late in the season; but given that we've done virtually nothing with them since we got them in February, we are both really, really chuffed. 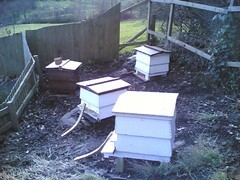 We've now shut them down for the winter, put in the apiguard and tomorrow I am going to feed them. We got four hives in February and had five swarms from them at the beginning of April which in retrospect really weakened them. 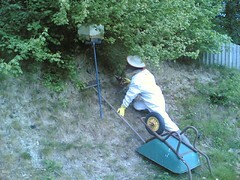 We lost one hive completely during the wet summer and now have two strong and one weak hive. We took a super each off the strong hives. Congratulations. What's the wheelbarrow for in picture two? b) put the box under the tree on the ground and hit the branch with a hammer and hope they all fell in to it. Both of them were quite difficult to do because of the way the ground sloped away and because I was so fat I couldn't get in to the only other bee suit we possessed at this point. So we were using the wheelbarrow to kind of wedge the boxes and the brooms up. Oddly, of the five swarms, three of them chose to hang in this tree ... the first one Arvo caught by method a), the second one I caught by method b) and the third one I pretended I knew nothing about when it flew off down to the village; I was here on my own and past the tree-climbing stage of pregnancy. Well done Chez - Did you take off all the honey the hives had or did they have more than one super each ? We left one super on one hive, that had two - the other one only had one. The brood chamber was pretty heavy though. I'm not sure about feeding now, I thought it was okay - I will need to check because I'm in trouble if that's the case . 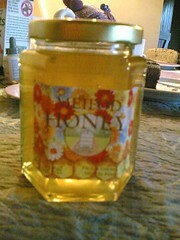 That very jar of honey is now sitting in my larder, it is delicious too! Pookie, you can do my advertising .